Pam Murrell, CEO of the Cast Metals Federation, was pleased to join with Anthony Evans, MD of Sarginsons Industries Ltd, to speak to some of the young students from the WMG Academy for Young Engineers about casting as a route to manufacture as part of a tutorial to support their BTec Level 3 Metallurgy Unit. The WMG Academy Trust operates two sites in Coventry and Solihull for 14 to 19 year olds, and aims to encourage young people to study science, technology, engineering and maths, working alongside businesses and the University of Warwick. As Anthony explains, “Sarginsons Industries sponsors this unit of their BTec in Engineering each year. It is important that we increase the pipeline of young people coming into the business, as part of our normal employee development and succession planning process, and this is an ideal way for the students to find out about us as a business by visiting, meeting some of our engineers and technicians and carrying out short placements – we can then use this as part of our selection process to find the most capable and enthusiastic candidates for the apprenticeships that we can then offer to the school leavers. 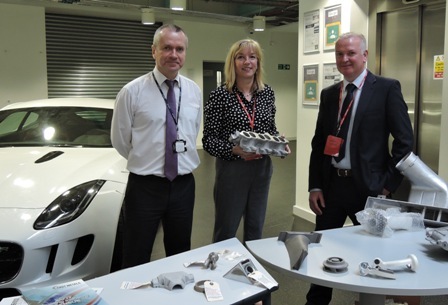 Picture shows from left: Paul Spence, Engineering Teacher, WMG Academy for Young Engineers with Pam Murrell, Cast Metals Federation and Anthony Evans, Sarginsons Industries Ltd.